“You’re a damned obstinate little devil!” Aubrey exclaimed. Pride and passion vie for supremacy in this fresh new telling of E.M. Hull’s romance classic. 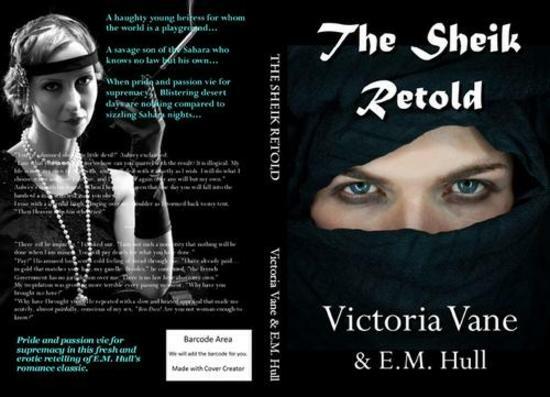 Carol, I have read the original THE SHEIK by EM Hull and although it is certainly not politically correct for today’s market it is a well written, good read. I look forward to Victoria’s reimagining and think it will be truly a wonderful read. Unfortunately it isn’t available on Kindle in the UK but I have bought a second -hand copy from Amazon Marketplace which has been dispatched today. Victoria is kindly sending me an ARC at the end of this month and I’ll be doing a Q&A about the book with her on the blog in October. So I wanted to read the original before I read Victoria’s book. I love Victoria’s writing and, like you, I’m sure it will be a wonderful read. THanks so much for posting my cover, Carol! I’m very excited about this book.